Favorite Line: But there was a whisper at the back of her mind, and only he could have put it there: I have come to transform you, transformation is my business. Well, I admit to not really knowing what I think about this book. It is one of those to mull over for an extended period of time in the back of your mind, the way you would allow a sip of wine to rest on your tongue in order to understand its complexity. 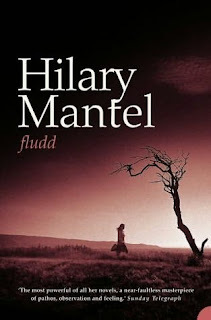 So is Hilary Mantel's Fludd, though. I have only read one other book by Mantel, A Place of Greater Safety (which I reviewed on my old blog here). I loved that book and would highly recommend it to anyone with an interest in the French Revolution, though it is certainly a door-stopper. Fludd, on the other hand, is a very slim volume that could probably be read in a day. Understanding it fully, however, probably takes much longer than it took me to read A Place of Greater Safety. Do you ever get that feeling when reading a book that you're a part of something special and very important, but you aren't entirely sure that you can grasp the entirety of what the author is presenting to you? That is the feeling I had with Fludd. It didn't seem as though there was much plot to the book until the very end, and then all at once I was finished and was left feeling as though I had read everything closely but had somehow missed The Big Picture. The book is about religion and faith and the positive and negative effects the two can have on people. But there is so much more to it. Symbolism, I might say, up the wazoo. There are statues and nuns and obscure questions of faith ("If one uses dripping to cook on a Friday during Lent, is that considered eating meat?"). A never-ending carafe of whiskey. A priest who claims disbelief in God to Fludd, but who then says that the devil lives in Netherhoughton. (Can you believe in the devil but not in God? Is that not depressing?) And then, the biggest enigma of them all, there is Fludd. He arrives and miracles happen. No one can really describe what his face looks like. He appears to finish the food on his plate, but no one ever sees him put food in his mouth. He doesn't seem to do much of anything, but he comes and he goes and things are different. His name, at the least, suggests a great deal about him. I realize that I haven't so much reviewed this book as made oblique references to how much it has remained in my mind after I finished reading it. Isn't that a stellar review in and of itself? I should think most authors want readers to continue chewing over their stories after reading the last word. I am still chewing (much as Fludd spent much of the book chewing without seeming to eat anything). But I think I know enough about my reaction to recommend the book- it is a misleading slim volume, but it will stay with you after you're done. Which is good, because then we can discuss it! Not sure if I will ever run across this on my reading list, but it sounds really interesting (possibly too thought-provoking for me). Fludd is an unusual title - though your link to more info on it provides even more mystery! Wow! This book sounds amazing, and like something I need to read really soon. I love books that make you puzzle over them, even after you have turned the last page. I am going to get my hands on a copy as soon as I can. Thanks for the excellent review! I like my books to have an aftertaste...I love thinking about what the author wrote long after I am done with the book. In that respect "Fludd" appears to be the perfect read. Thanks for pointing us to this book! Great review, btw! Hilary Mantel is great at creating tension and suspense. That's a stellar review to me, it's made me hop over to Amazon and order it. Sounds fascinating. You were out in my neck of the woods!